On Sunday, at the California Libertarian Convention in Long Beach, delegates voted for two candidates to share the party endorsement in the Governor’s race. What follows is a recounting of events and an explanation of why that’s healthy for the party. When the Chair, Ted Brown, opened the call for endorsements, our own Tim Ferreira approached the podium with an unorthodox motion. Rather than moving for the party to endorse either Nickolas Wildstar or Zoltan Istvan for Governor, Mr. Ferreira made his motion to endorse both of these candidates. Although the delegates were caught by surprise, the motion passed by a majority vote, and both candidates were endorsed. However, it didn’t end there. With the June election just around the corner, expect to see the LPSF’s arguments all over the Voters Handbook that will be mailed out next month. 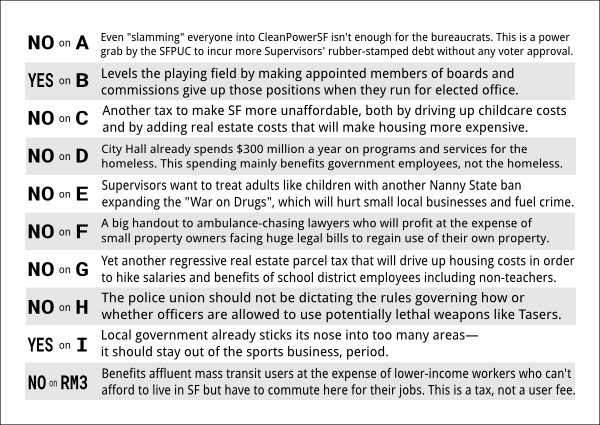 There are 10 local propositions on the ballot for San Francisco County, and we covered most of the major ones either as the official opponent or in our paid arguments. Here’s a short synopsis of our arguments that you won’t hear about in the local media. Most judges’ races are anything but exciting. Unless you know the judge personally, they’re all pretty much the same when it comes time to vote. However, what would you say about a judge who imposed punitive attorneys’ fees on plaintiffs working in the public interest to improve election laws? Punitive to the tune of $243,279.50. Usually it's the other way around – heartless Republicans trying to screw the poor, and Democrats trying to "help" them (but without addressing the actual source of the problem, and often making it worse). But yesterday's Examiner (March 4) had a kind of "man bites dog" story – Assembly Bill 503, authored by Republican Assemblyman Tom Lackey of Palmdale and signed into law last year, requires local agencies to offer payment plans to poor people burdened by government fines they cannot afford. As implemented locally by Cisneros, the plan goes "far beyond what was legally mandated"
Recently every board member of the San Francisco Board of Education demonstrated what hypocrisy in action means. The entire Board of Education unanimously rejected an application for a new KIPP elementary charter school set to open in the Bayview next year. Never mind that hundreds of parents, teachers, and students showed up in support of the charter school. Never mind, also, that a large chunk of the KIPP supporters were African-Americans from the Bayview, which the Board purportedly wants to help, but when push comes to shove, you can always count on government bureaucrats to vote for the status quo and less individual choice. After all, they do know better. A public park in San Francisco's SOMA district has been sitting closed behind a fence for almost all of 2017, with chain link fence segments installed in February replaced with a $145,000 black iron barrier in June. Because, you know, if those in power didn't do things like saying they're going to use taxpayer money for improving parks, then "improve" them by closing them so you can't use them, it would create a public health risk – people seeing a well-functioning government might die of shock! Freedom is dangerous. If you ever want to see a Libertarian elected in California, your action is needed to repeal the restrictive Top 2 law that has made it much more difficult to get on the ballot. or visit https://stoptop2.com to donate, become a circulator or subcribe to the newsletter.